A couple Friday nights ago, it rained. It was a wet, cold, dark, and dreadfully gloomy night, and anyone with even a lick of sense nested with their coziest blanket in the softest part of their couch, ordered a pepperoni pizza, and watched re-runs of their favorite reality TV shows into the wee hours. Phil and I had other plans. You see, that weekend marked eight years together, and we weren’t going to let a few icy puddles keep us from celebrating in style. So we went to Chew, and it was awesome. Before I get into our dinner at Chew, let me just say one thing. At this point you might think I’m incapable of forming a negative opinion, or unwilling to write a bad review about any Jax restaurant. Well I have, and I will. But there have just been so many positive dining experiences since moving here that I’d rather write about them for now and save the negativity for another cold, rainy day. For now, I’m just in too good a mood, so let’s get back to the fun stuff! So! We went to Chew, and it was AWESOME! Since we had tickets to see Taj Mahal at the Florida Theatre downtown, we wanted to do dinner somewhere nearby. Chew was the obvious choice. The restaurant has an undoubtedly urban, modern vibe – all clean and slick and minimalist – yet warm colors and organic elements like wallpaper whimsically decorated with images of birch trees and funky light fixtures lend approachability to the space. We felt very welcomed and snug when we stumbled in off the slippery street with our dripping umbrellas. Our waitress took good care of us and we met a number of other friendly and helpful staff throughout the evening who were all knowledgeable about the menu and made inspired recommendations. 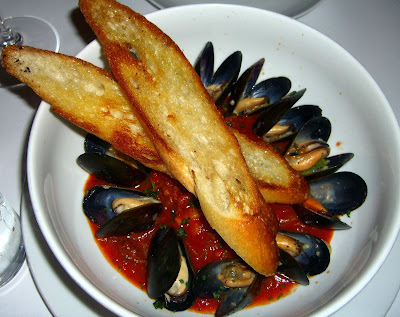 We started the evening with an appetizer of plump mussels tucked into a roasted tomato fumet with house-made fresh chorizo and baguette toasts. It was a pleasure to compare this dish with a dish of clams and house-made chorizo I’d enjoyed the week before at a wine dinner at Orsay. Although the two dishes seemed similar on paper, they were very different in execution and each perfectly fit the menu and season in different ways. While Orsay’s version was light and thoughtfully paired with Emilio Moro’s Finca Resalso, I was happy to see that Chew’s interpretation was hearty and substantial, with the warm, subtle spiciness of cumin scenting the tomato sauce – a perfect starting point for a chilly winter evening meal. We scooped up as much of the tomato and chorizo sauce as we could with the baguette toasts, and found ourselves wishing we had more bread to capture every last bit left in the bowl. 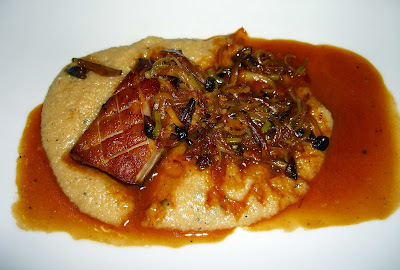 We also shared a starter of what the menu appealingly titled “Bacon:” tender braised pork belly with smoked leeks and roasted wild mushrooms resting on a soft bed of sage grits and surrounded by a honey gastrique. Do I even need to tell you how delicious this was? I also ordered a bowl of French onion soup for an appetizer. Why not?! 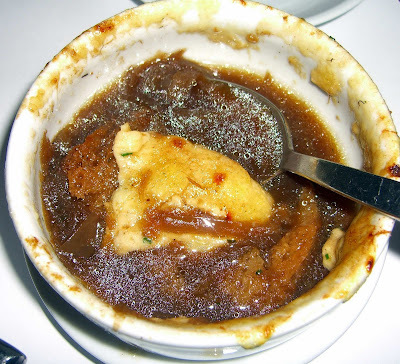 The crouton maintained its integrity in the rich, densely-flavored, perfectly-seasoned beef broth. 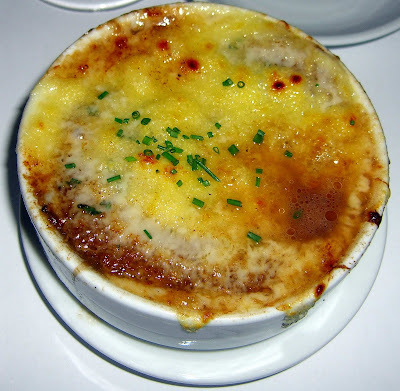 I personally adore any sort of melted cheese but wished the gruyere topping (or was it emmentaler?) had been broiled just a little longer to provide more caramelized brown goodness on the top of the bowl to complement all the caramelized brown goodness inside the bowl. Here, I pushed aside the cheese so you could admire the broth. Mmmmmm. Talk about a winter blues buster. 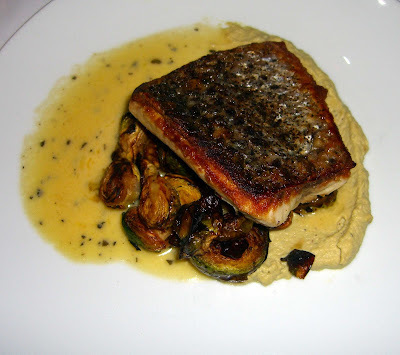 For my main course, I ordered striped bass with roasted artichoke purée, brussels sprouts, and a sage beurre blanc. This dish was one of the best examples I have ever tasted of the chef considering each and every element of the plate, and how the flavors of each component work towards creating a cohesive whole. All together, it really was greater than the sum of its parts, even though each of the parts was impeccably executed. The fish was well-seared and juicy, the tiny Brussels sprouts were extra brown – just like I like! 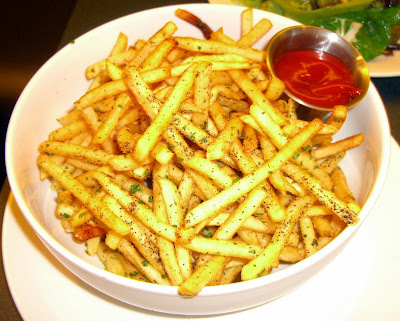 – and the artichoke puree was surprisingly tart and earthy. I made sure to get a bit of everything on each forkful. Phil went on… and on… and ON! JEEZ! I GET IT!... 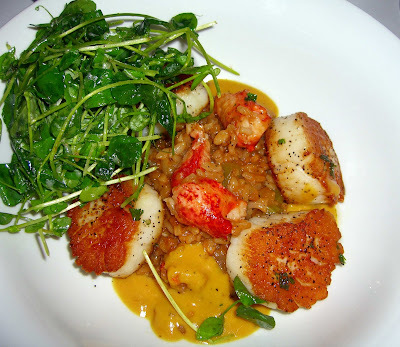 about the seared scallops over lobster risotto, one of the evening’s specials. 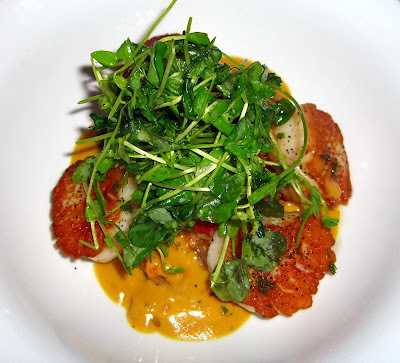 Apparently it’s not easy to properly sear a scallop, judging from those I’ve recently eaten at other soon-to-be named local restaurants… but Chew accomplished the task effortlessly. And, apparently it’s not easy to make a properly creamy risotto, judging from risottos I’ve recently eaten at other soon-to-be named local restaurants…. but again, Chew absolutely delivered. Throw some lobster in the mix, and what can there possibly be to complain about? We accompanied our mains with a side of braised asparagus. WHOA! Unexpected delicacy! These were extra-fat asparagus, not the wimpy pencil-thin ones, so they really held up to braising in a buttery sauce. We found it absolutely essential to ask for a basket of bread to soak up the extra braising liquid. You can get Bahn Mi at PK Noodles on Beach Blvd (between Kernan and St. Johns Bluff).! They have the pate and all! Also, I'm a new reader and am enjoying your blog! Also, welcome to Jax! 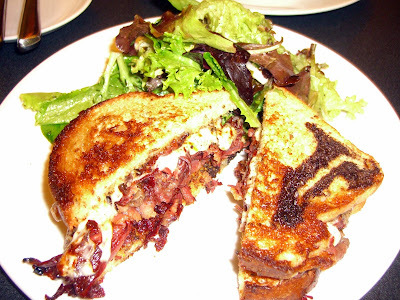 There are definitely some dining gems in this town. You have found some of them already, including my fave --13 Gypsies. Not sure if you have already tried Pastiche, but that is a definite fave also! I second Natalie's comment about Pho King's Bahn Mi. They make their own banquettes, and they're cheap! 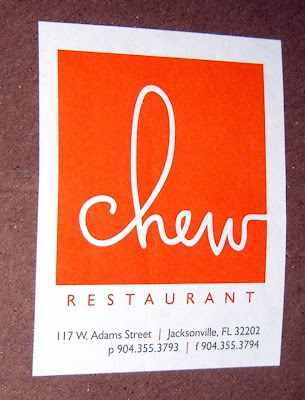 The only time I visited Chew, it was tasty, but had issues in some departments, I read somewhere that they have a new chef since, so I must give it another go. 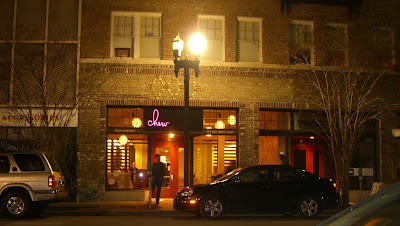 @Christopher - we were really happy with everything we ordered at Chew - you should definitely give it another try. What were the issues you had with it before? Now I'm excited about PK Noodles' banh mi! Gotta grab one soon! Well, a friend and I had gone with a lot of hype from other people/media etc. We ordered a caeser salad and a lot of the lettuce was brown and the dressing was very bland. I also ordered the mussel dish, but it was a main dish with pasta. I agree, it was fantastic but there were about 3 mussels at the bottom of the dish still closed. Other than that, it was tasty. We had a mushroom gnocchi dish that was amazing. 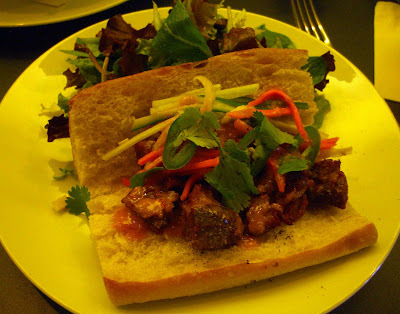 I'm a Bahn Mi freak, and I try them whenever I can - have tried them here in Jax made by Saigon Time on Cassat, but sold at the Viet grocery next door only on weekends - not a great representation! I still think the best one I ever had I got at a grocery in 1998 for $1.29 - it ruined me forever! I too shall soon check out the ones at PK Noodles. Thanks for the Chew review - that goes on our list as well. Another wonderful review with great pictures and writing. I have observed that you are generally positive in your reviews, but I think it is because as an experienced critic, you are highly sensitized to the subtle cues that tell you not to bother going to a place. Just like me, you trust your first instincts. If you're not greeted immediately upon entry to an establishment, get out. Any sign of disorder or chaos in the front of the house indicates sloth and desuetude or worse in the back. Other danger signs like excessively long menus, uncleared tables, etc are all things you probably key on. It is a pleasure to read your positive reviews - there is way too much negativity around, especially down here. @Christopher - wow, our dinner wasn't plagued with anything even approaching those issues!!! The ingredients were all top-quality the chef didn't skimp on anything. Please give them another try! 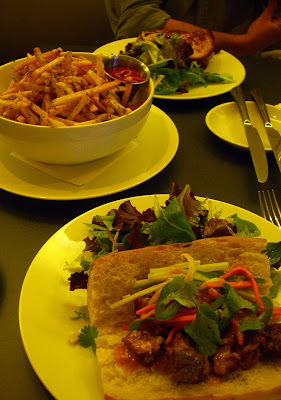 @drfugawe - nice to meet a fellow banh mi freak:) The ones at PK Noodles are priced at only $3-5 and from the menu descriptions, seem pretty authentic. Looking forward to checking them out! Let me know if you make it to Chew. @Frederick - you're right - I'm new to town and obviously I want to eat at the GOOD restaurants. Why would I spend my money and time and energy eating at places I'm almost sure to dislike... just for the sake of writing a negative review? Not my style, but I have heard some comments hinting at the fact that I don't have the nerves to write a bad review. I am very glad you appreciate the positivity! Believe me, Cletus and Brandine supply all the negativity this town can handle. People like you are a ray of positive sunshine reminding folks that the End Times are not, in fact, upon us. Magnificent idea and it is duly ciallis canada get A joke for you peoples! What weighs 909 kg (2,000 pounds for all of you inefficient, non-metric "people") and is bare to the bone? A skeleTON!! !